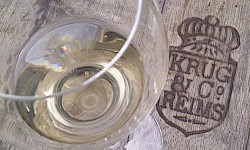 Krug is one of the most famous names not only of Champagne, but of the entire world of wine. Founded in 1843 by German immigrant Johann-Joseph Krug, the house established an extraordinary reputation during the 20th century, built around its multi-vintage wine known today as ‘Krug Grande Cuvée’. Grande Cuvée blends wines from different villages, years and grape varieties. It is a complex construction built by ‘architect’ and Cellar-master Eric Lebel, and one that has always been shrouded in secrecy. I have always loved the Krug Grande Cuvée, as a Champagne that somehow combined an innate richness and vinous gravitas with delicate freshness. It seems to defy time, so that opening a 10 or even 20-year-old bottle of Grande Cuvée (as I have been lucky enough to do a few times) reveals a wine with developed, honeyed weight but also an extraordinary vitality. The end (or beginning) of an era? Having treasured the reputation of their wines over successive generations, it was something of a shock when the Krug family announced in 1999 that the company had been sold to Louis-Vuitton-Moët-Hennesey, owners of two of Champagne’s biggest houses, Veuve-Clicquot and Moët et Chandon. But though much of the administration and logistics behind Krug has been streamlined and centralised, everyone involved in the company’s current senior management stresses the autonomy given to the house by LVMH, not to say a certain indulgence. And the family is still closely involved with Krug. The energetic and charming Olivier Krug has taken over the mantle of Director, and his father Henri and uncle Rémi still participate in blending decisions. The dynamic management team is completed by Eric Lebel and President Margareth Henriquez. Venezuelan-born Margareth brings something very different to the table, having previously headed up LVMH’s Argentinean interests. Together they are a hugely experienced and yet youthful team who have shaken things up in the hallowed halls of Krug’s HQ in Reims. 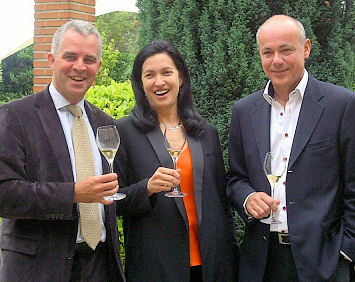 Left to right: Olivier, Margareth and Eric. Krug’s Grande Cuvée is an extraordinary blend of around 120-140 wines from many different years. In fact Krug holds around 150 reserve wines, all of which are at the disposal of the blending team to create each edition of the Grande Cuvée. The reserves currently go back as far as a 1995 Pinot Noir from Bouzy, and these wines form the basis of each new bottling, blended with wines from the most recent harvest. In terms of the wine-making, Krug is famously known for fermenting its base wines in oak barrels from coopers Seguin Moreau and Taransud, and all at medium+ toast level. Eric Lebel explains however, that the purpose is not to flavour the wine: “For the first three years new casks are filled with wine to season them, but that wine is sold off and never used by Krug.” He says the most important think about using so many small casks is to allow each small plot to be vinified separately. The oxygen exchange via the fine-grained oak also makes the finished wine more resistant to oxidation in bottle, which partly accounts for Krug’s legendary freshness. The second day or our visit to Krug included a very special treat: we got to try our hands at playing Cellar-master for the day, with an array of 14 samples made up of both reserve wines and the newest 2010 young wines. The challenge was to create our own ‘Grande Cuvée’. The journalists were split into four, three-person teams. Luckily I was partnered with Michael Edwards, one of Champagne’s greatest authorities, and the ever-thoughtful and knowledgeable John Gilman from the USA. We had a great hour or so trying to create a wine that we thought had the properties of a typical Grande Cuvée and which was also delicious. This exercise really demonstrated the mind-boggling complexity and finesse of the task undertaken each year for the blend. With 14 samples it was relatively easy to pick out the wines which were heavier or lighter, riper or more lean, fresher or more evolved, but to multiply the available choices x 10 and know that a certain quality level has to be achieved takes massive skill and experience. And after evaluating our attempts, Eric Lebel finally revealed the secret of what will one day be the 166th release of the Grande Cuvée, based on the 2010 harvest: 58% of the blend is 2010 wines, 42% reserve wines. Given the disappointing quality of the Chardonnay crop in 2010 the vast majority of the 39% Chardonnay in the final blend is reserve wine, with the 2010 crop contributing more within the 45% Pinot Noir and 16% Pinot Meunier in the blend. In total, 140 different wines constitute the latest Krug Grand Cuvée. 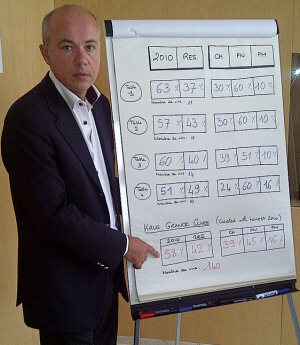 Right: Eric talks through the blends of the four teams, and the ‘real’ Grande Cuvée from the 2010 harvest. Very delicate pale green colour, with little golden hints. Beautifully fresh aromatics, with green apple, a touch of green fig, but a lithe, creamy quality with plenty of lemony vibrancy. The palate has a very fine, crisp, racy mousse, with lots of life and richness, masses of lime-like and apple fruit and that very delicately nutty and spicy background. All sorts of small exotic spice notes and mineral saltiness too, and lovely harmony and length. 93/100. Go to part II: Vertical tasting of Krug Clos du Mesnil, Vintage and Clos d’Ambonnay.